With Christmas and New Year’s quickly approaching, it’s a great time to stock up on wine so you can grab a bottle to take to family dinners and parties, or have available at home to serve during evenings with friends (or just for you!). We’re lucky to live in a state that is home to many wineries that produce great wines. We’re also fortunate to have great friends who live in Traverse City near many of Michigan’s wineries. Because we often miss them not being close, we try to go north a few times a year. This also provides opportunity to pop into our favorite wineries to taste and purchase! While red wine is a preferred choice for many of our friends, I admit to not being a fan of dry reds. I also have a mild allergic reaction when drinking red wine (I get really, really hot and my skin flares up with red patches. Not pretty so I rarely drink red wine in public!). But we have tasted many different red wines to find a few that we enjoy and can serve at home. 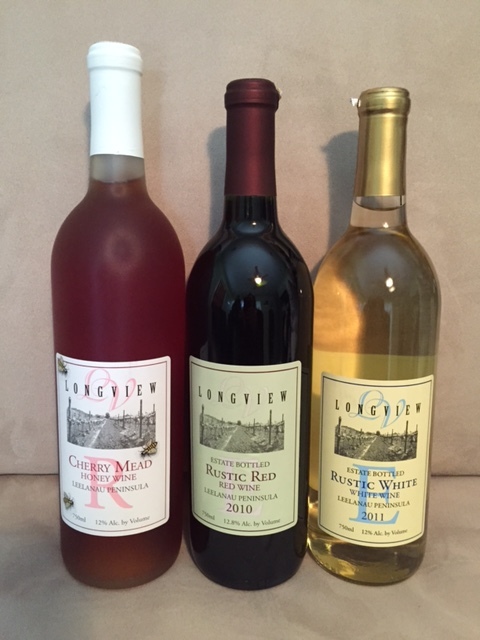 Longview, located in Cedar on Leelanau Peninsula produces a few of our favorite wines. Their Rustic Red is a very smooth wine that is “rich with ripe berry and cherry flavors and hints of spicy clove.” The winery suggests serving it slightly chilled for the best burst of flavors. I enjoy a glass of Chateau Fontaine’s Big Paw Red because it’s not too dry and not too sweet. It incorporates three hybrid grapes for a great flavor. 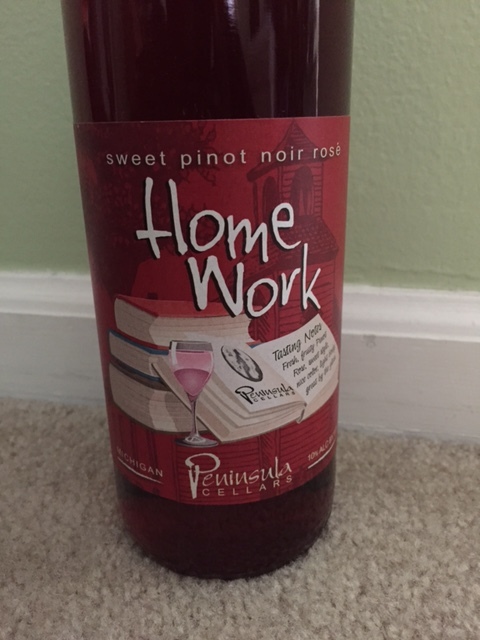 Peninsula Cellar’s Homework is a big favorite of my older sister and some friends. It’s actually considered a rose’ with a little sweet taste of strawberry, watermelon and raspberry flavors. Delicious! Longview also makes one of our favorite white wines, Rustic White. This light wine is “loaded with tropical fruit flavors,” yet it’s not too sweet. We get positive reviews every time we serve this wine so Longview is a definite stop when we’re in Traverse City! They also produce a very good Chardonnay that is fermented in stainless steel rather than oak. If you like a sweeter white wine like me, try a Riesling. This type of wine is typically sweeter and filled with various fruit flavors, such as peach, citrus, pineapple and apricot. Riesling has its roots from Germany and balances acidity and sweetness for a crisp taste that pairs well with a variety of foods. Riesling wines are usually categorized as sweet, semi-sweet or dry. Chateau Grand Traverse’s Late Harvest Riesling has long been my favorite sweet Riesling. It is definitely a sweeter wine, yet oh so good! The winery describes it as “dazzling fruit and crisp citrus flavors balanced with a naturally sweet finish.” It certainly dazzles my taste buds when I drink a glass! Ranked up there with it is Black Star Farm’s Arcturos Riesling. The winery describes it as “vibrantly alive, fresh, and highlighted with a balanced sweetness” with “aromas of fresh fruit followed by concentrated flavors of apples, apricots and peaches complemented by honey undertones.” In fact, this light, sweet wine won the first wine tasting party my husband and I hosted with friends. We recently discovered Left Foot Charley’s The Missing Spire Riesling wine – it’s a medium sweet late harvest that is loaded with flavors that are delicious on your tongue (this winery also makes great hard cider). If you want to try delicious fruit wines, check out Chateau Fontaine’s Cherry Wine, Longview’s Cherry Mead (Honey Wine) and Black Star Farm’s Pear wine. All of these have a light, sweet taste…and the cherry wine pairs perfectly with dark chocolate! There are so many more wineries in Michigan that offer excellent choices to drink. These are just a few of my favorites. Whatever you choose, enjoy (and drink responsibly! ).